"Many thanks for your useful tips and information. I left with increased self-confidence." "Teacher was good, experienced and enthusiastic!" Dapper Dragen provides babywearing and parenting consultation in 's-Hertogenbosch and Eindhoven. Our mission is to bring parents and children closer to each other. We remove insecurities surrounding the care for your newborns or small children. We pay attention to ergonomic babywearing and healthy growth and movement of your baby. We don't only consider the baby, but the entire family. We focus on a healthy bond (attachment) with your baby. We promote and support breastfeeding. Dapper Dragen is mostly active in the 's-Hertogenbosch and Eindhoven regions (The Netherlands), but provides consultation and workshops throughout the whole country. 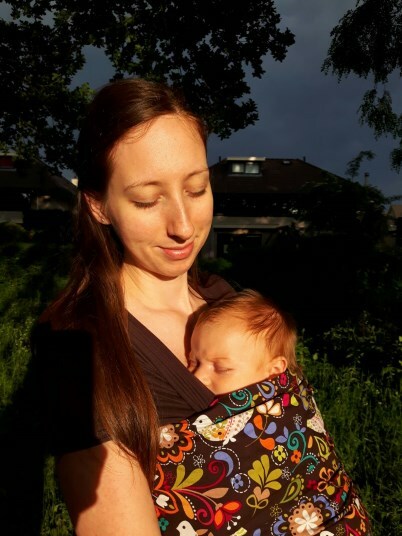 The founder is Melinda Mészáros, certified babywearing consultant and newborn and child caregiver. In order to provide parents with the latest information, we cooperate with a network of professionals, such as IBCLC lactation specialists, (maternity) nurses and physiotherapists. These days you have access to more information on parenting and child development than ever before. There are numerous web sites and internet fora where parents exchange experiences. During pregnancy and after giving birth you are surrounded by professionals who are ready to advise. Many pieces of advice turn out to be useful, but you'll notice that you often encounter contradictions and are confused. At Dapper Dragen we regularly talk to parents who experienced the advice given by the G.P., the child consultation office ("consultatiebureau" in Dutch), maternity nurses and midwife to be misaligned. Moreover, your own parents(-in-law), friends and acquaintances might not hesitate to give their opinion. All this (undoubtedly well-meant) attention causes many a person to feel flooded with information in the first days of parenthood. Our goal is to provide clarity and self-confidence. We are here to help you trust your own intuition. At Dapper Dragen we keep an eye on scientific developments with respect to parenting and child development. Furthermore, we work according to the general WHO (World Health Organization) and UNICEF guidelines. We provide one-on-one consultation to parents (to be) about babywearing, for example using a wrap or carrier. See babywearing. We also sell sustainably produced baby wraps, carries and accessories. See products. We provide one-on-one consultation to parents (to be) about supporting the posture during pregnancy with a wrap. This is called belly wrapping. See belly wrapping. We develop and give workshops to parents (to be) about caring for a newborn: breastfeeding, crying, sleeping rhythm, movement, babywearing, attachment, (instinctive) parenting, etc. See Goede Start baby workshops. We provide one-on-one consultation to parents (to be) about caring for a newborn (as described above). See parenting consultation. For families with a non-Dutch background (such as expats) we have a special program in English about parenting in the Netherlands. We provide information on how things are arranged in the Netherlands with respect to pregnancy, birth and child care. We discuss the various institutions with which new parents will be confronted and which services they provide. We also pay attention to the cultural aspects of parenting in the Netherlands. We develop and give accredited courses for maternity nurses and other obstetric care professionals about instinctive parenting, attachment and babywearing. See professionals. Dapper Dragen is established in Vught. If you would like to know more about us you can read who we are.